The third and final part of Sh1zuka‘s Anime USA 2011 report. This one focuses on the growing pains of the burgeoning convention, which will move to a new location at the Marriott Wardman Park this year. AnimeUSA 2011 was held from November 17 – 20, 2011 at the Hyatt Crystal City in Arlington, Virginia. 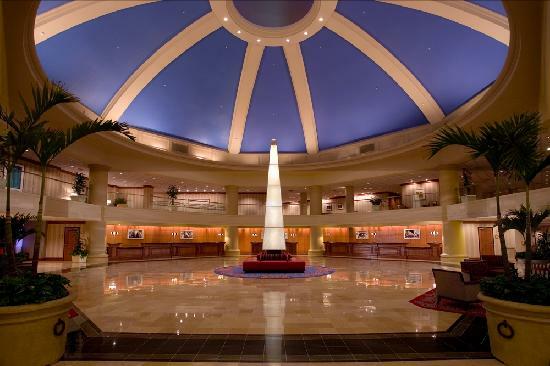 This hotel has been used years prior to hold Katsucon and Otakon. Katsucon’s hotel, the Gaylord at National Harbor, is visible across the river from AnimeUSA’s hotel, and many of the AnimeUSA staff also staff Katsucon. It’s interesting that AnimeUSA will also move away from the Hyatt Crystal City. Next year, AnimeUSA will be moving to the Washington Marriott Wardman Park, a larger venue that should solve many of AnimeUSA’s current problems. As an attendee of AnimeUSA since 2009, I feel that AnimeUSA has finally outgrown the Hyatt this year, so the venue change is a welcome one. At 8:30 PM on Friday, the convention is still buzzing with activity. AnimeUSA’s layout changed significantly this year, moving the Video Game Room and Convention Operations to the upper floors, and moving the Art Show to the B1 level. A fourth track for panels was added at the bottom floor, in a large, stadium-like room. Placed in the middle of the Artist Alley, the Art Show garnered much more attention than last year, where it was located in a corner on the bottom floor. I feel like the new location of the Art Show is a major improvement. Unfortunately, I could not get any pictures of the new location as photography was (rightfully) prohibited. AnimeUSA 2011 Hotel Map. The floors 3rd, 2nd (top row), B1, B2 (bottom row). However, some of the other layout changes were questionable. 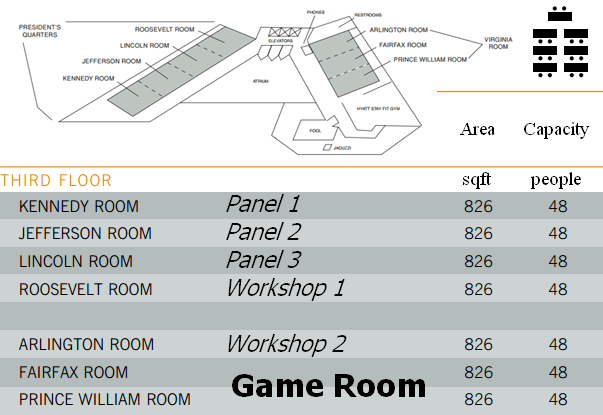 I managed to completely miss the fourth panel room during the convention, as it was located in a corner at the bottom of the convention. Also, the Video Game room was moved from its location on the B1 floor to the 3rd floor and placed next to a Workshop track. I heard complaints that noise from the game room bled over to the workshop room, making it difficult to hear the panelists unless you were in the front row. Due to having only one entrance/exit, the AnimeUSA Video Game Room could not be held in the same location as it was in 2010 because of fire safety concerns. As the convention guide was printed to show the Game Room in its previous location, it seems like the change was made last-minute due to an order from the fire marshal at the convention. As a result, the Board Game Library was cut from programming this year. Dealer’s Room: Crowded and hot! I have always found AnimeUSA’s dealer’s room organization to be quite good; going back this year, I found the usual booths near their usual locations. Hen Da Ne sells doujinshi (fanmade manga) and Japanese video games; Anime Sekai sells your typical figures and artbooks, etc. I also noticed a new vendor selling Asian snacks, Anime Snack Time, with a snazzy booth. I look forward to seeing them at other conventions that allow food sales. AnimeUSA allocates space at the center of its Dealer’s Room to allow anime conventions to advertise, but surprisingly, AnimeUSA’s own Dealer’s Room table has been moved from the convention island to just outside the Dealer’s Room along the Artist Alley. I spent a little bit of time wandering through the Dealer’s Room this year, and it was very crowded and hard to move through at peak times. This is the first year that I’ve actually felt like the Dealer’s Room was very hot, and comments from both attendees and dealers agreed with this. I really felt like AnimeUSA has outgrown its dealer’s room this year. Thankfully, the Dealer’s Room is open late and the traffic clears up then, but hopefully, the new venue that AnimeUSA is moving to will solve all of these issues. AnimeUSA offers six tracks of programming with 90-minute (or multiples thereof) timeslots for panels and workshops. 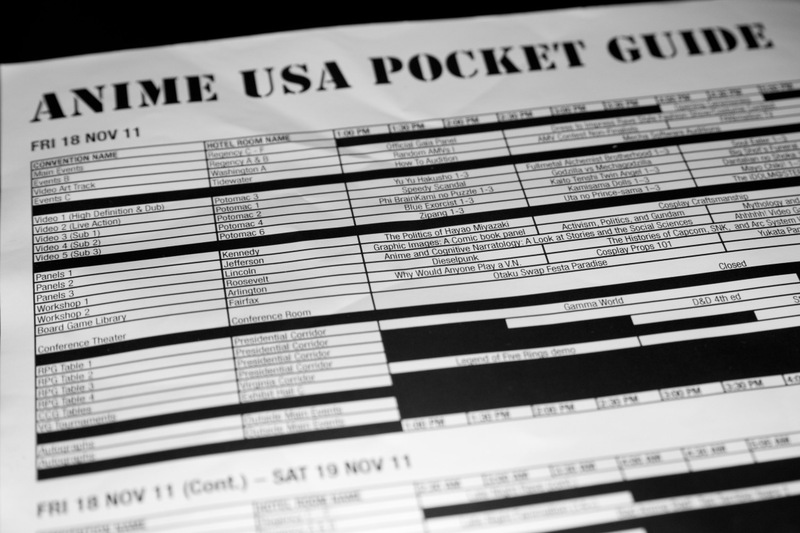 The unusually long panel length of 90 minutes makes it easier to organize the schedule at the cost of programming density, as fewer panels require multiple timeslots. Unfortunately, five of the six programming tracks were located far away from the rest of the convention, on the 3rd floor. Even so, lines still formed before popular panels, creating major traffic issues along the narrow 3rd floor hallway–tabletop gaming tables along the hallway reduced the width to as little as five feet wide. The small panel/workshop rooms, with a capacity for about fifty people, rapidly filled up for many panels, and staff had to limit the number of people inside the room. The panel rooms could only fifty people. Sound pollution has been a recurring issue for AnimeUSA’s panels. This year, non-18+ panels were finally allowed to close the room doors, solving sound pollution issues from the outside hallway. However, the wall between the panel rooms is still just a thin wall, and it was not difficult to hear the next room’s laughter drown out the voice of the panelist of the panel you are in. This was particularly tragic for the Workshop 2 track this year, which competed against the noisy video game room next door. People in the back could barely hear the panelists, even with a mic and a sound system. 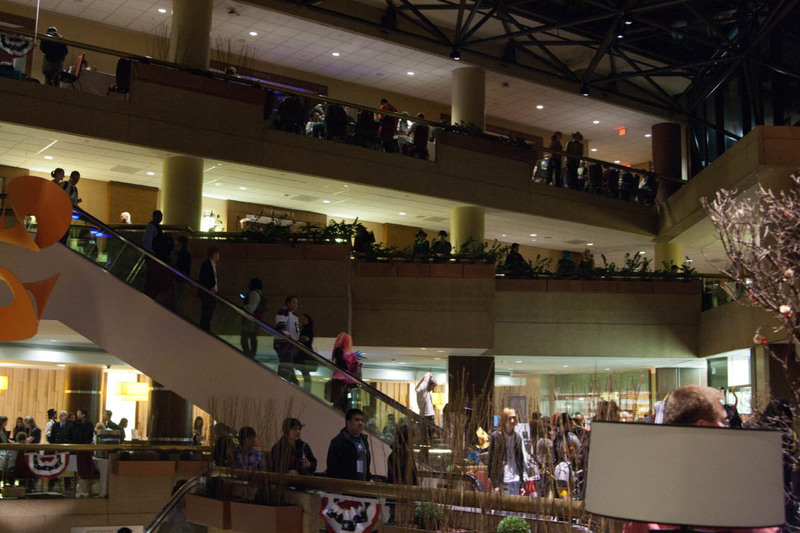 AnimeUSA’s main issue this year, outgrowing the Hyatt Crystal City, is going to be solved next year by its move to the Washington Marriott Wardman Park. With four times the convention space of the Hyatt Crystal City, AnimeUSA is going to be able to finally significantly grow in size, something that it deserves for putting together a very fun convention and addressing issues each year. I look forward to attending AnimeUSA 2012! 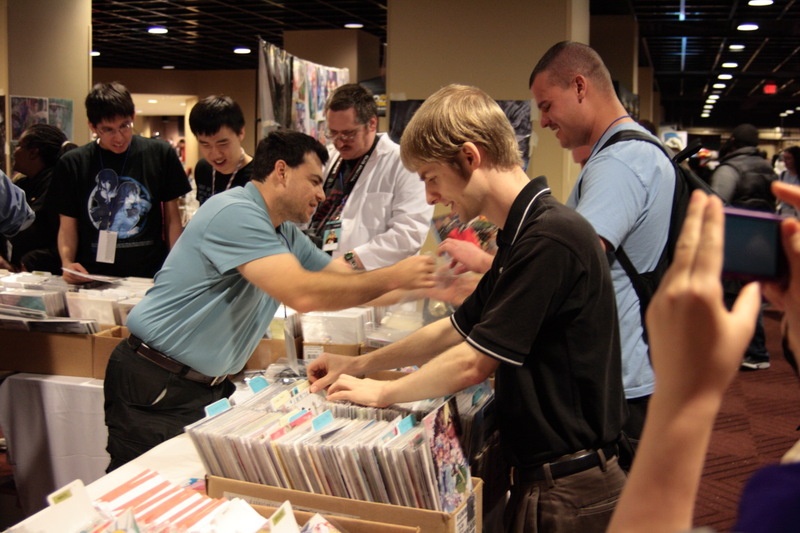 The second of three guest articles about Anime USA 2011 by Sh1zuka. This one focuses on the maid cafe and host club! Photos by scout and Shizuka. One of the advantages that AnimeUSA has is being held at a hotel with its own restaurants. During AnimeUSA, the Hyatt Crystal City’s two restaurants are converted into a wonderful Maid Cafe and classy Host Club, open on Friday and Saturday. 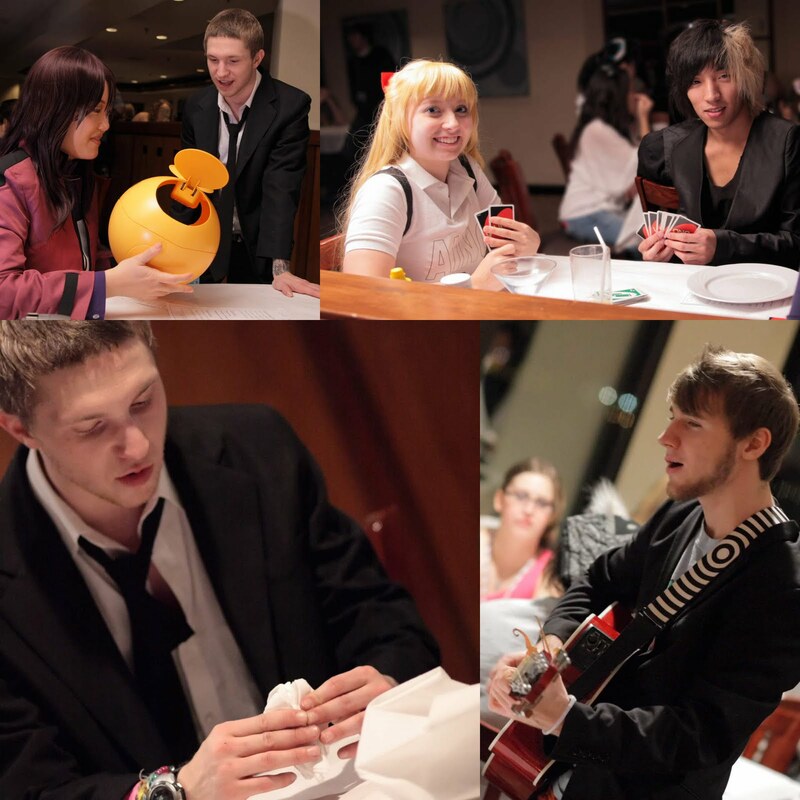 Since the introduction of the Maid Cafe and Host Club at AnimeUSA 2009, AnimeUSA has improved it every year. While the basic formula has remained the same, the logistics of meal tickets and accessibility have improved each year, making going to the Maid Cafe and Host Club less of a time and energy commitment. This is essential for an Anime convention with a very packed programming schedule. Entry to the Maid Cafe and Host Club is done on the second floor, where a party can queue for entry to the perpetually busy Maid Cafe and Host Club. Food can be purchased using “tickets” bought for two dollars each at the respective location, and games can be played with the maids or hosts by paying cash. I’m not sure why food is required to be purchased with tickets, but I believe it is a regulatory issue. 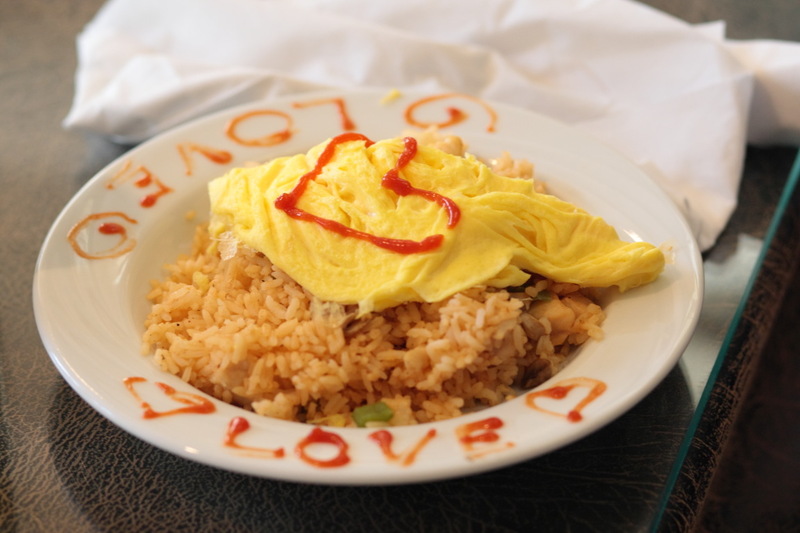 The AnimeUSA Maid Cafe, open during the breakfast and lunch hours of the convention, serves a variety of sandwiches, desserts, and Japanese snack food. All dishes are served by maids, who bless your food with “Moe~ Moe~ Kyun! ❤” before you’re allowed to eat! All dishes served with love too. 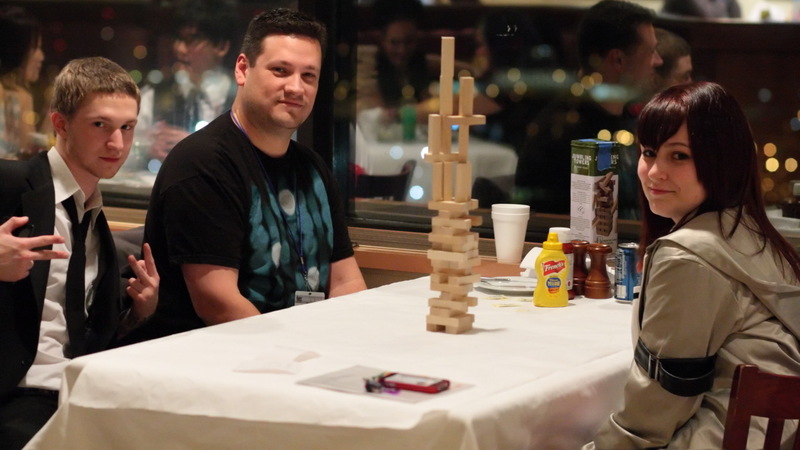 The Maid Cafe also offers games that a customer can play with the maids, like Jenga or UNO. If a customer plays enough games, he or she can also get a picture with a maid of his or her choice. Well, it was mostly guys who wanted pictures with the maids! If you’re not in the mood for games, that’s fine too; sometimes, a group of maids will suddenly burst out into dance! 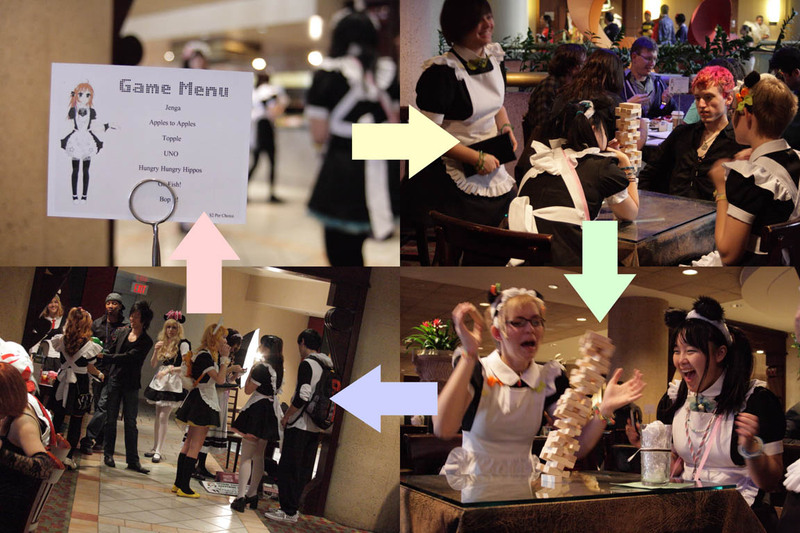 This made me wonder how much preparation AnimeUSA’s maids needed to work at the Maid Cafe. An application form is available on the website, but it does not go into detail about what kind of training is required or if talents are necessary. So I asked one of the maids at the Maid Cafe. It turns out there isn’t much training at the convention. The training they do at the convention is about serving the customers’ food, as there is not enough time to train all of the maids to dance/sing at the convention. Thus, talents such as dancing, singing, or playing a musical instrument are considered big pluses for applying. So the “sudden outburst of dance” was only possible due to the dedication of the maids, who must have practiced popular Anime dances well before AnimeUSA. Unfortunately, you can’t pick your maid. 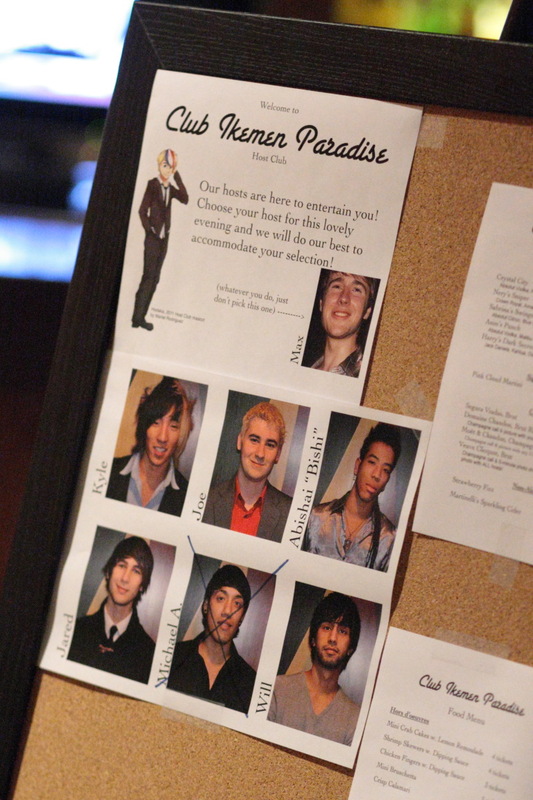 For dinner, AnimeUSA offers the “Club Ikemen Paradise” Host Club, located at the top floor of the Hyatt. This host club requires customers to be 18 years old or older to be admitted to the club, which is unfortunate since the average age of an anime convention attendee is less than 18 years old. As the Host Club serves alcohol to those of age, it may be a restriction due to Virginia law. A queue to get into the Host Club, conveniently located on the second floor, allows potential customers to see how long the queue is before wasting an elevator trip. At the end of the queue, customers are allowed to ride the “Host Club Express” Elevator, which only goes between the second and the top floor. This is a major improvement for this year’s Host Club, efficiently using the few available elevators. Unlike the Maid Cafe, you can pick your host at the Host Club. Upon arriving at the Host Club, you or your party is allowed to choose your host for your table, who will entertain you while you wait for your food. Although the food portions are small and rather expensive, the food is good and the Host Club’s service is excellent. Alcohol is even offered at the Host Club, although prices are extremely steep. 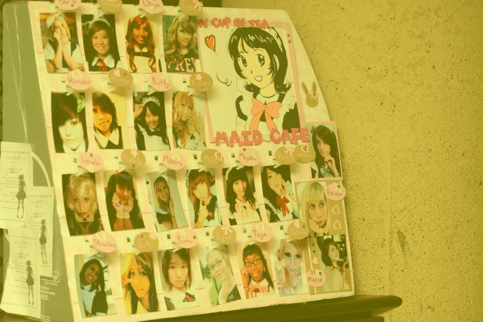 Activities at the Host Club are similar to the Maid Cafe, with games and photos available in exchange for cash. Unlike the hyperactive excitement of the Maid Cafe, the atmosphere of the Host Club is more tranquil and laid back, possibly because the Host Club caters to an older audience. While the food at the Host Club takes much more time to prepare than at the Maid Cafe, the skyline at the top floor is beautiful and the hosts seem to enjoy spending time at their tables entertaining customers. At my table, my host played music, joked with my friends, and folded origami while our food was on the way. During my wait, I wandered around the Host Club taking pictures and noticed that almost everyone at the place was having fun: many customers played games with their host while waiting for food, and hosts would sit with their customers entertaining them if they looked bored. As with the maids, many of the hosts were very talented, knowing how to play music and engaging in fun banter with their customers. Hosts showing off their talents and entertaining guests. Overall, I would say that AnimeUSA runs the best Maid Cafe and Host Club of the East Coast Anime Conventions. Although AnimeUSA is moving to the Washington Marriott Wardman Park in 2012, AnimeUSA intends to keep the Maid Cafe and Host Club running at the new hotel. If you skip these and you’re going to AnimeUSA this year, you’ll miss out! You might wonder why AnimeUSA is changing its convention venue. 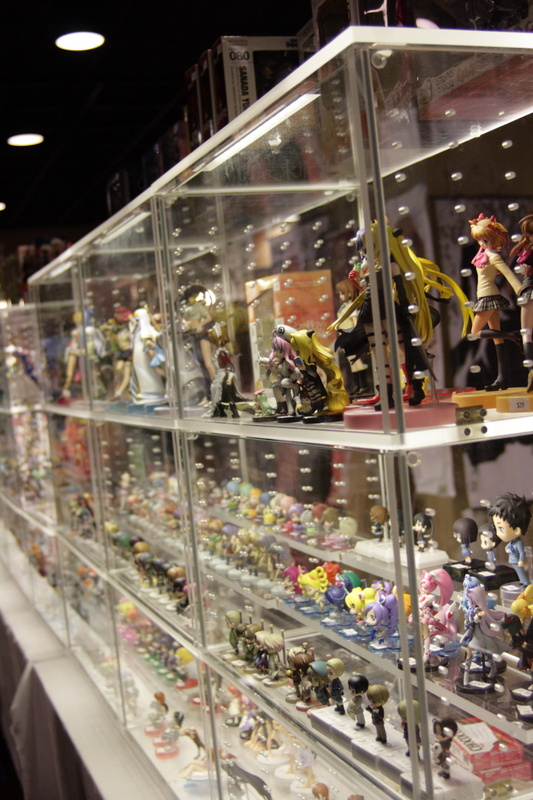 Find out more on my next post, AnimeUSA 2011: Outgrowing the Hyatt—coming on Wednesday! At a convention, there is an opportunity to explore new music, and Mix Speakers. Hearing from their MySpace page, they music seems J-poppish. But this groups is a visual kei rock group, so my impressions of them will be further cemented this weekend. They are known for their monster and fantasy look, so outside of the concert they’re having tonight, they are also having a photo shoot, of that I am quite curious about. This is all at Anime NEXT 2011. So expect more of my thoughts and snippets from my twitter, and the under the hashtag of #an2011. Whew, made it just in time, before their United States debut at Lollapalooza tomorrow. Part of X-Japan specifically Yoshiki and Sugizo were at Otakon’s Masquerade last weekend as half time guests. They performed at the very end after the 30 skits of the Masquerade was over. (Jon took pictures when that happened…) Yoshiki and Sugizo performed a piano and violin acoustic set of Forever Love and Endless Rain.Definitely some of their iconic songs of what their group is, Forever Love being the theme for X the Movie.. This is a transcript of my notes from the the press conference that was after the masquerade (reorganized for clarity). Jon has video of this event, but let’ s see what happens when he posts it up. I was able to get in some questions..(My questions are going to be bold font).. I found a place with a much better transcription, than what notes I have, so if you want to refer to that, then here is the link. Can Yoshiki talk about a rumor of reconciliation with Taiji? He denies it, but they are in talks about a possibility of reunion. Nothing is confirmed though. What led to the decision to re-film “Rusty Nail” at their Los Angeles appearance? What is their feeling for what the future of visual kei going to be like? Yoshiki – Deep Question. Someone has to break into the market and not sure of what will happen. The scene will keep evolving, changing and attempts of trying will happen though. What is the personal preference in performance..quiet or loud? Mix, depends. Personal fans of X Japan will probably expect to hear Japanese, although they do have many English songs. What message do you have for American fans as well as people who will see them at Lollapalooza? Yoshiki – “Something new… something historical” is going to happen. “There are consistent walls between the east and west. Hopefully [X Japan] can smash hole in the wall.” Without fan’s support then X Japan wasn’t able to reunite and perform. Will do anything to make up to the expectation of fans. Sugizo – “Music has no boarders” He is very excited to perform with X Japan, since he has looked up to X Japan for a very long time. Following the press conference, we did see Yoshiki and Sugizo exit the premises, I saw Yoshiki sign a fan’s guitar. Yoshiki who is on Twitter now, tweeted this on August 2. I’m in LA now. I already miss my fans in Baltimore. As I mentioned, Jon did take more pictures of their appearance, but we are still in the process of putting it up on flickr. So check back on images yet to be posted. I have one more picture of their press conference that was able to be used.